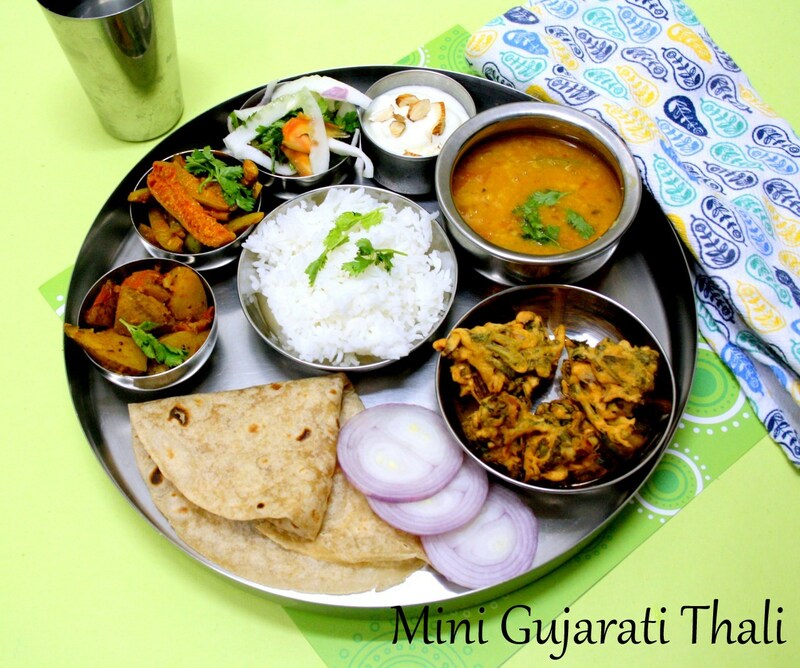 For the fourth day under Indian States, I planned a mini Gujarati Menu. I had been in discussion with Vaishali for a long time and each time I was changing the menu. I wanted to prepare quite an elaborate menu. I raided her Thali’s and drooled for the longest, without deciding on much. Anyway I knew that even if I wanted to decide, time for making that elaborate menu was not on hand. Then I remembered Rajani’s Mini thali and saw that she had referred Roshini’s Thali. And when I landed there, I saw that she had prepared it based on Vaishali’s suggestions and recipes. 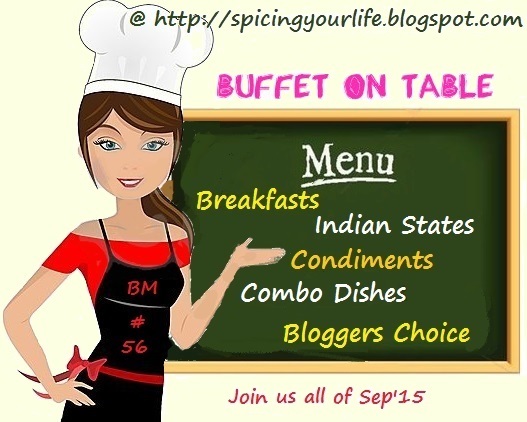 Now you know, if there is a gujarati thali running around this blogsphere, it must have originated from Vaishali! So seeing that the menu looked doable on a weekday, I selected a Friday, knowing if the dinner gets delayed, kids can still sleep late. Though the entire cooking process got done under an hours time, by the time we completed our dinner, it was quite late. Since the main dishes were so simple, I had planned on Golpapdi for sweets. That’s also one of the easiest sweets I felt reading the recipe. Still I didn’t make and served with Shrikhand, that I had made as well. 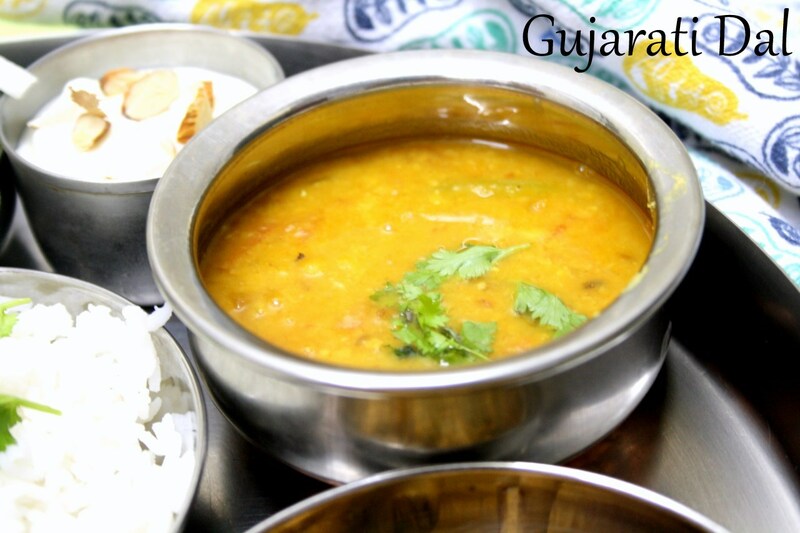 This Gujarati Dal is quite simple and easy to make, unlike the other Gujarati Dal I selected for ICC. Pressure cook the toor dal with turmeric and enough water. Let it cool and then grind into a smooth paste. MW peanuts in a cup of water for 5 mins, remove and keep it aside. Heat oil and ghee in pan. Add the mustard seeds. next add the clove, cinnamon, hing, red chillies and curry leaves. When it sizzles, add the toor dal along with tomato, jaggery, chopped ginger, chopped green chilli, chilli powder, turmeric powder and salt. Add some water as required depending on the consistency. Add dates paste, peanuts bring to boil and simmer for a few minutes. Switch off. Add the lemon juice. Since my family is not too much into sweet dals, I added very little jaggary and dates. I was wondering how the dal would taste with sweet in it. I add additional chilies or eat dal with pickle and trying to figure the taste of sweet dal with roti or rice. such a simple and elegant dal!!! so yummy!!! loving it.. I remember I made it from Sukham Ayu. Loved it..That is quite a feast, Valli. Love the sweetness in the dhal. We add jaggery in pretty much everything. 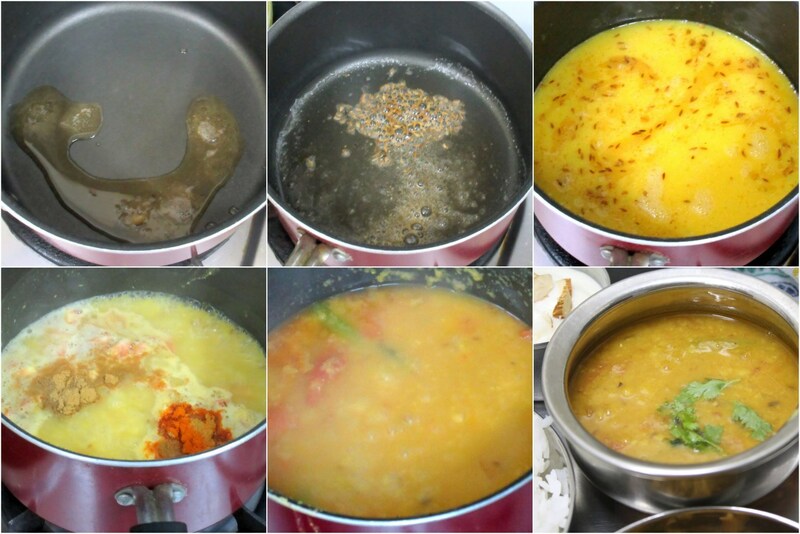 simple & delicious dal.. I too add jaggery in my gravies sometimes,to enhance the taste.. Addition of date paste in a dal is very interesting. 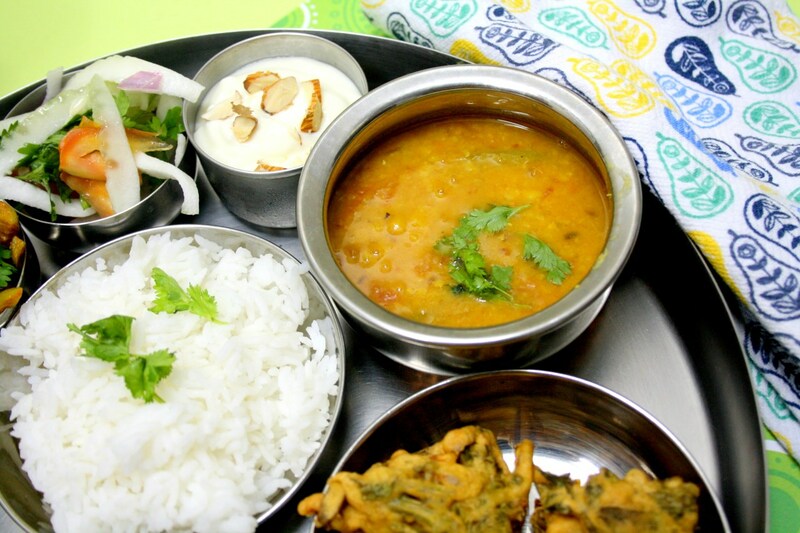 Dal looks so comforting and delicious. Looks tempting. Will try a small amount first cannot predict what will happen at home. Valli, is it different than the version we made for ICC?